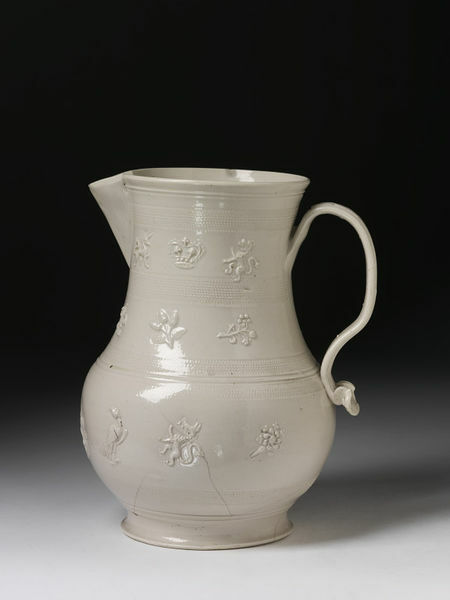 Jug of salt-glazed stoneware, pear-shaped with a wide neck and a reeded loop handle of flattened section, and with detached reliefs applied between four bands of fine roulette work and with a version of the royal arms within a Garter of the Order, crowns, a fleur-de-lys, lions, unicorns, a wyvern, a crowned harp, ships, animals and birds, acorns and flowers. 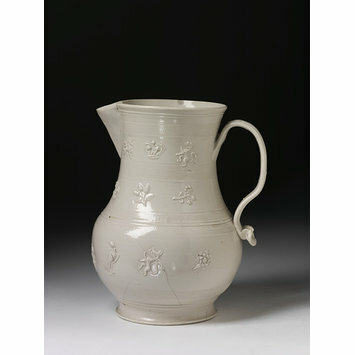 Jug of salt-glazed stoneware, pear-shaped with a wide neck and a reeded loop handle of flattened section, maker unknown, made in Staffordshire, ca. 1740.